The aircraft was bailed to Lockheed Aircraft Corporation (LAC) at time of the crash. The aircraft pitched up and crashed during flare on landing at Palmdale AF Plant 42, California on February 15, 1957 at 1321 PST. 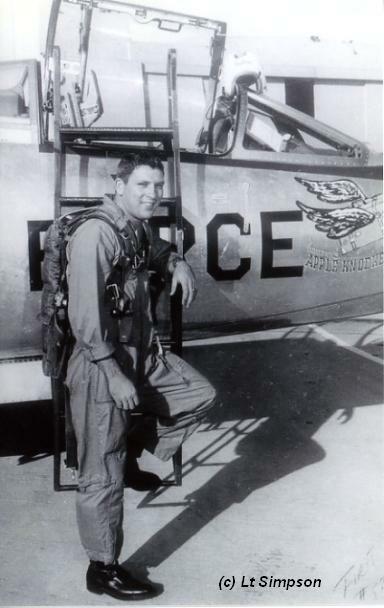 Joseph “Joe” Watson Ozier, a civilian engineering test pilot, was on a local test flight with empty tip tanks testing landings with land flaps but without the use of BLC (Boundary Layer Control). On final for the full stop landing the airspeed bled off to a minimum of 143 knots. The aircraft rolled uncontrolled to a right bank angle of 56° bank before dragging the right tip tank. The aircraft struck the ground and exploded. The pilot was thrown out of the cockpit, strapped in his seat, about 25 yards clear. He died later that night from the internal injuries and burns caused by the impact, The aircraft was written off. Joe’s (Ozier's) F-104 had left the runway, plowed through the wild grass and muddy ridges and ended up on its right side, the left wing and landing gear sticking out grotesquely. The tower operator said it seemed like a normal approach but over the threshold of the runway, the nose of the 104 pitched up, staggered, rolled right hitting the wing and nose about twenty five yards from the edge of the runway and exploded. It didn’t slide very far – just dug in. It was the impact that threw Joe and the ejection seat through the canopy. This was the first lost production F-104 in the world. 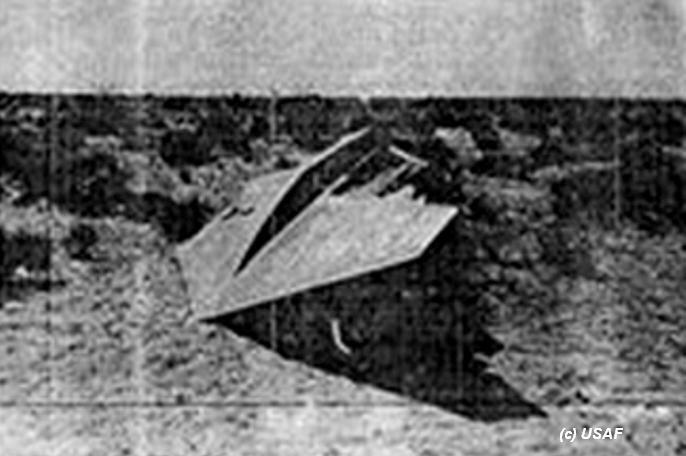 Written off after an accident near Edwards AFB on its delivery flight from Lockheed to the US Air Force (ARDC, AFFTC or AFSC at Edwards AFB). It flew at 17000 feet when it experienced a fatal engine flame out. 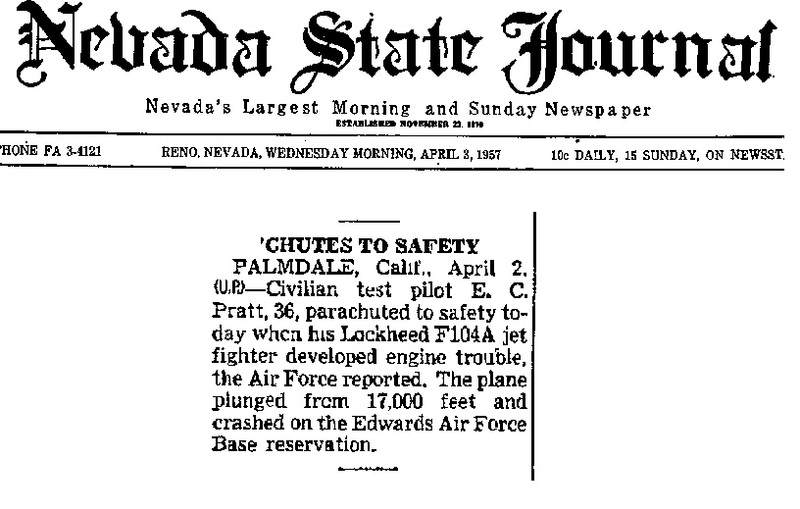 The Civilian Lockheed testpilot Ervine C. Pratt ejected and was safe. The aircraft impacted near the edge of Rogers Dry Lake, about 2.2 miles SSE of the Edwards AFB control tower. Some witnesses stated that there was a fairly deep impact crater and a lot of debris. The largest piece was the horizontal part of the T-tail assembly. It was lying just east of the south end of the old South Base cross-wind runway, not far from some of the stored aircraft that belong to the AFFTC Museum. The pilot Ervine Pratt (36 years old) was picked up by a truck and taken to the Base hospital for treatment of a bruised elbow. Since the aircraft was not yet delivered to the USAF there is no accident report released. See beneath some newspaper articles. Assigned to Lockheed as JF-104A modification test aircraft. It was lost this day in an accident at Palmdale. Pilot Jack Simpson was ok. The Lockheed pilot landed too hard, the right main gear collapsed and the aircraft skidded, then the left gear collapsed and the aircraft went of the runway, breaking the front fuselage. Glady the aircraft did not caught fire and Jack Simpson could step out. It was after a testmission in which simulated flame-outs had been tested. During his fifth simulated flame-out landing he climbed to 20,000 ft. (above the terrain,) and circled to make a simulated flame-out approach to runway 22 at Palmdale. After permission of the tower he started a left 45 deg. bank. Everything went according to plan as he hit low key at 7500 ft. at 240 knots, 276 mph. But when he started his final turn he was wide to the right of the runway. He quickly asked the tower for wind velocity and direction. “180 degrees at 20 knots, gusting to 28,” the tower answered. Since he was blown of his flightpath he added power to pull it in a little tighter to have his roll out on final at 1000 ft. at about the 3/4 mile juncture at 240 kts. The pilot then made, what could have been a fatal mistake. He had to turn a little right to line up with the runway about the time he started his flare and he put the gear handle down. He was immediately dropping faster than expected and saw the end of the runway coming nearby quickly. He seemed to fill the cockpit. He pulled the 104 back to flare but it had no effect on his rate of closure. It was too late to avoid a rought touch down on the concrete. He stop cocked the throttle, and was in the process of unlocking the canopy when the aircraft hit the runway. One gear hit it after the other. The 104 bounced high, still launching forward, with great speed and force. The pilot pulled the drag chute lever but this had no effect. Then he pushed on the canopy to see if it was free to open. At last the aircraft which carried nickname ‘Appleknocker’ ended up along the runway with substantial and structural damage. It could not be repaired any more and was scrapped. 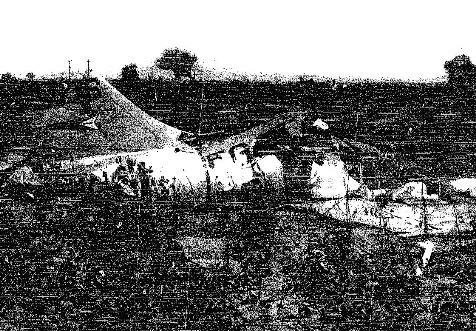 Beneath two photos showing Lt Simpson with his 55-2955 "Appleknocker" and a photo taken after the accident showing clearly the substantial damage to the airframe. This Starfighter was written off after an accident near Palmdale, California, west of Barstow, near Harper Dry Lake. Pilot Jack Simpson ejected safely. Clear air turbulence ripped off one of the tip tanks which sliced through its tail at 27,000 ft. The aircraft tumbled uncontrolled, pilot Jack Simpson ejected safely and aircraft crashed at Harper Dry Lake, west of Barstow, California. It was flying out of Palmdale, California. The tip tank had been installed improperly. The aircraft belonged to the Lockheed Flight Test Center. The IFS owns a copy of the official accident report. 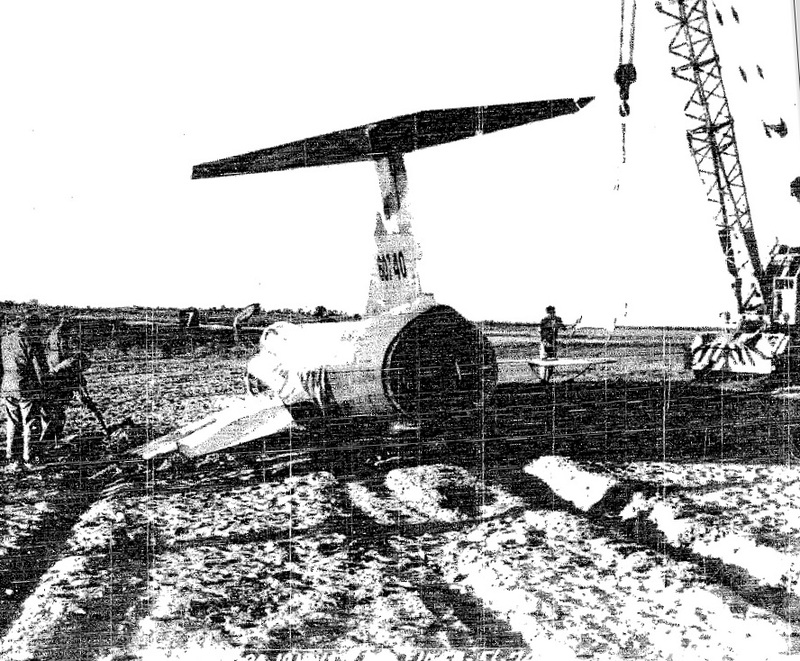 Beneath a photo showing the tail section after the crash. 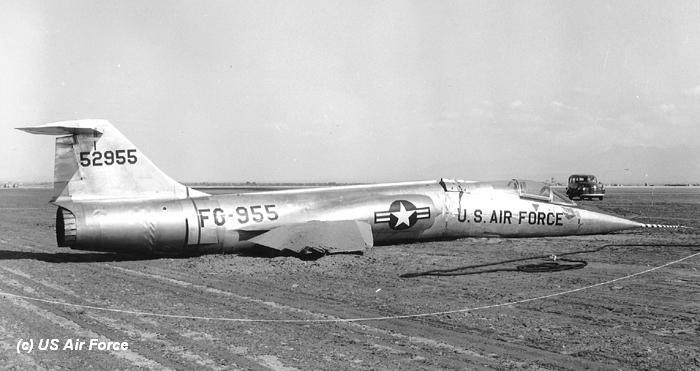 Crashed on Eglin AFB during a runway accident but was repaired soon and operational again on the 6th of May 1958. It crashed 12:20 hours PST at San Bernardino, 20 N Miles NW of Camp Irwin on Leach Gunnery Range, in California during an gun shooting test mission after encountering a compressor failure. Lockheed Engineering Test Pilot, Arthur Joseph Peterson tried several airstarts which were not successful. Then he ejected safely at 2500 feet. 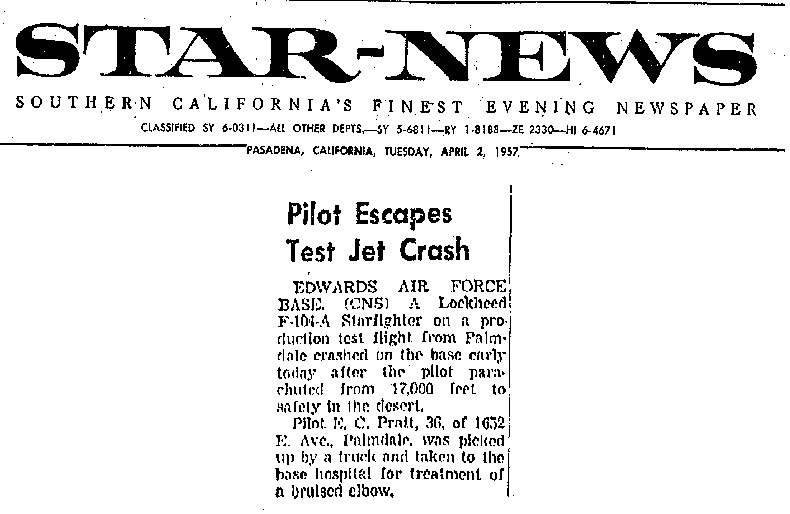 Aircraft took off from AF Plant 42, Lockheed, California, a flight which lasted 21 minutes before crash. After the accident the engine was shipped to Evandale for study. Results are unknown.Previous testflights have shown that gun debris (links and shell cases) from the T-17 E-3 gun when fired in flight from the F-104A strike the fuselage and ventral fin in a random manner from an area in line with the engine inlet air ducts aft. A fix to this problem consisting of installing an 8”x16”vertical steal deflector plate in front of the shell case and link ejection chutes had completed wind tunnel tests and was being flight tested. Tests were not complete but were not progressing satisfactorily as the fuselage and ventral fin continued to receive random strikes from the gun debris. The accident occurred during the fifth flight (fourth flight that the guns were fired) in a planned series of flights to test the deflector plate. The test aircraft was F-104A 55-2970 on LAC s/n 1016, on bailment to Lockheed Aircraft Corp (LAC) flown by Peterson, an LAC Engineering test pilot.Capt Carson (chase pilot) observed the aircraft, after Peterson ejected, continue straight ahead and crash in a level position, explode and burn briefly. He followed Peterson down to get his position then returned to Edwards AFB and accompanied the rescue helicopter back to the crash scene where Peterson was picked up and returned to Edwards AFB. Peterson was on the ground for 1:20 hours after landing.The IFS owns a copy of the official accident report. After accumulating over 1000 flight hours it crashed. It was caused by a structural failure resulting from a 'unsecured' fuselage fuel tank cap coming off and striking the vertical stabilizer. Testpilot William Parks Jr. ejected successfully. The USAF accidentreport reveals: “after losing control while flying a chase mission forcing the pilot to eject. The pilot was only slightly injured but the aircraft was destroyed in the crash 12 nautical miles south-southwest of Bakersfield, California. The pilot was William “Bill” C. Park, a Lockheed Engineering Test Pilot. 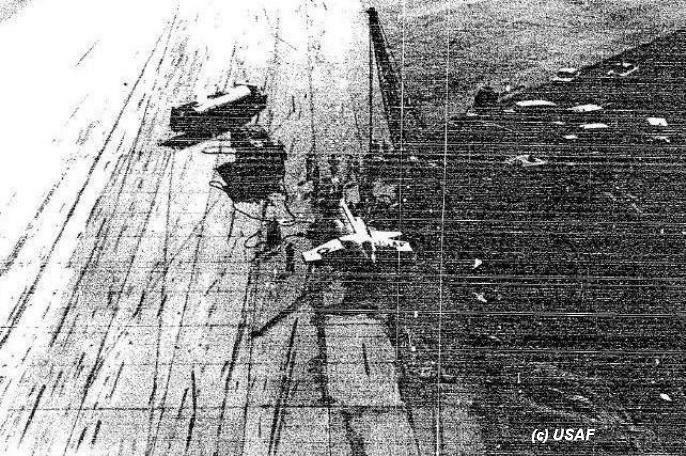 This accident occurred with XF-104 53-7786 acting as a chase plane for F-104A 55-2957 (piloted by Robert Mayte) conducting an empennage dynamics engineering test flight out of Air Force Plant 42, Palmdale. This XF-104 was bailed to Lockheed for use as a chase plane and for pilot checkout and proficiency. The F-104A under test was flown to 12,500 ft at subsonic speeds under full military power with the XF-104 in chase. On the second test the F-104A was accelerated to Mach 1.05 at which point Park in the XF-104 was subsonic and dropping back. He then reported control trouble and shortly thereafter that he was bailing out. Mr. Park experienced difficulty trying to eject, but eventually ejected and was not injured. Park landed one-half mile southeast of the XF-104 impact point and was picked up by a civilian in a truck who had seen him land. He rode to the scene of the crash where a California State Highway Patrol car took him to the hospital. Duration of flight was just 10 minutes. It encountered a wheels up landing at Palmdale during a Lockheed testflight (operated by Lockheed) but could be repaired soon. Aircraft owned by the USAF bailed to Lockheed Aircraft Corp for testflights as JF-104A test aircraft and flown by Civil engineering test pilot Arthur Joseph Peterson. After completion of a test flight for APC (Auto Pitch Control) evaluation the pilot performed a straight in approach with the gear confirmed “down and locked” and visually confirmed by a tower observer. On touchdown the landing gear was in the up position. The aircraft slid on the belly for 5,300 feet. The landing gear handle was confirmed in the up position. Lockheed engineering testpilot Arthur Joseph Peterson was unhurt. The aircraft was repaired soon after. The IFS owns a copy of the official accident report including a rough photo seen beneath. This day it encountered an accident, damaging the aircraft on Eglin AFB. It could be repaired soon, including a modification/upgrade to F-104A 1-LO standard. Written off after an accident on Eglin AFB, Florida. It crashed 2 miles N of Eglin after engine failure on take Off. Pilot Maj. Van Matre was sadly killed. It is very strange that the USAF could not provide any official accident report for this accident however we have some copies of newpaper articles mentioning the accident, like beneath found inside the Panama City News Florida. The aircraft belonged to the AFOTC (Air Force Operational Test Center) at Eglin AFB. This QF-104A was lost in the Gulf of Mexico during its second unmanned flight, operated from Eglin AFB. It was likely due to a technical problem. It was not shot down. It had an landingaccident at homebase Eglin AFB. Pilot Major Edward Ballinger was ok. Following a local test mission, the aircraft landed hard on the runway overrun at Eglin AFB, Florida, 500' short of the approach end of the runway, breaking the left MLG strut. Aircraft bounced and came back down on the overrun leaving gouge marks made by the broken strut. Aircraft departed the runway skidding left at the 2,060' mark and continued 765' off into the sand. No fire occurred and the pilot egressed safely with no injury. Damage was substantial but it could be repaired. The IFS owns a copy of the official accident report including the rough photo beneath taken after the accident.